This tale of Blanding’s turtles living in our midst started back in the hills of western New York State decades ago. I first encountered one as a summer camp naturalist during my college years. In that pre-internet era, I simply knew those odd-looking turtles as, “yellow-necked turtles.” It wasn’t until I settled into my nature-embracing, trail-trekking ways on the Wilder Side of Oakland County that I discovered its true name and learned of its status. 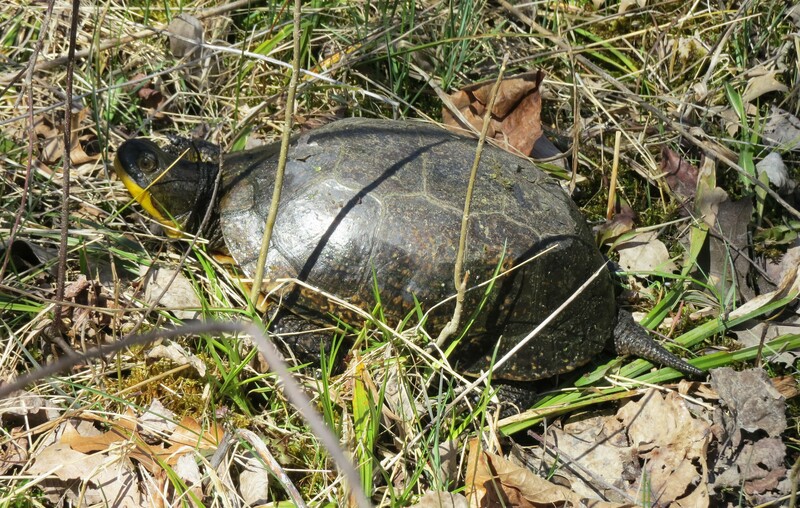 The photos of the mature Blanding’s turtle that accompany this week’s wilder side blog were captured at Rose Oaks County Park and along an abandoned trolly line that cuts through a wetland area of Brandon Township in northern Oakland County. In the heat of the summer this rather nomadic species of turtle is most often seen early morning or evening; when the days really sizzle they sometimes go nocturnal. 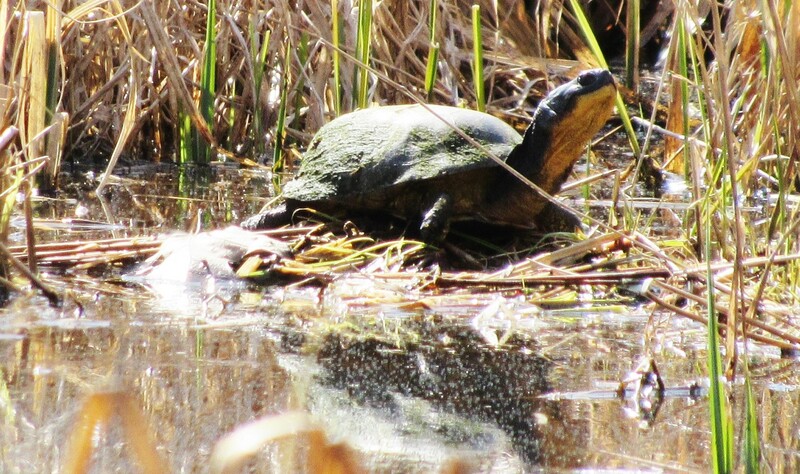 You won’t find a Blanding’s turtle in a noisy lake with jet skis or powerboats, these rather skittish and “shy” turtles inhabit quiet shallow waters with abundant aquatic vegetation. 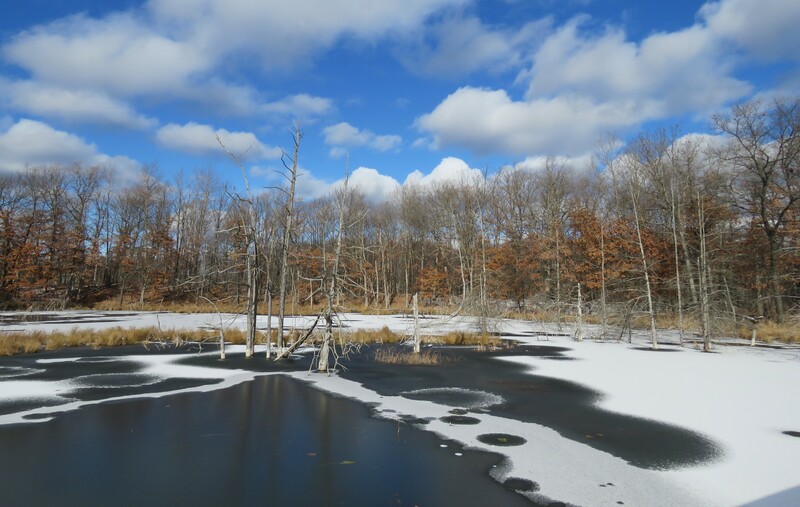 In Oakland County that habitat includes secluded marshes, chemical free rural ponds with quality shoreline vegetation and slow-moving backwaters; all which is managed by the Six Rivers Nature Conservancy, North Oakland Headwaters Land Conservancy, Southeast Michigan Land Conservancy and many of our Huron-Clinton Metroparks and Oakland County Parks along with some sections of our State Recreation Areas and State Parks under management of the Michigan Department of Natural Resources. 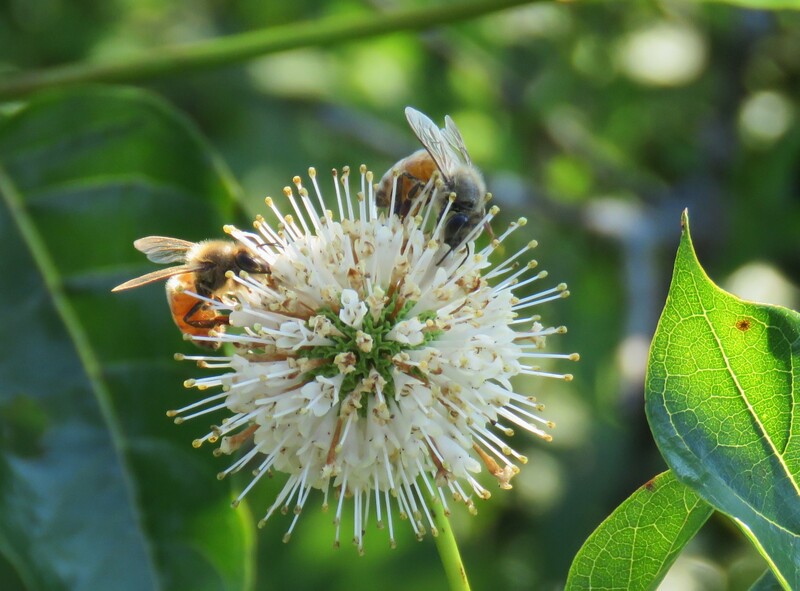 Of critical importance is easy access to adjacent land habitat suitable for egg laying. Break walls and other obstructive landscaping practices along shorelines often prevent this from occurring. Blanding’s turtles bear little resemblance in appearance to the other nine native species of turtles found in Michigan, with two possible exceptions, the Eastern box turtle and the Spotted turtle. The Blanding’s turtle has earned the nicknamed of the “Semi-box turtle” because its plastron (bottom shell) is hinged like that of a box turtle’s plastron, however it does not snap as tightly shut as a box turtles. Young Blanding’s turtles are also heavily spotted, creating a bit of confusion with the Spotted Turtle. The Blanding’s turtle is considered semi-aquatic; a species that wanders back and forth from wetlands to land where it feeds in both habitats. Herpetologists agree that crayfish is a favored food, but they will also readily take frogs, snails, leeches and minnows. Fresh berries, slugs, and earthworms add to the diet on land, however land is wrought with danger, especially during the egg laying season of last month. Raccoons, skunks, coyotes and foxes are all fond of fresh turtle eggs and crossing roads to reach sand to lay eggs is often a fatal act. A few years ago, I had the privilege of taking photographs at a Blanding’s turtle “Head Start” program at the Shiawassee National Wildlife Refuge; a cooperative effort to boost Blanding’s turtle population between the Detroit Zoological Society, the U.S. Fish and Wildlife Service and the University of Michigan Flint. The Detroit Zoo summarized the ongoing work this way on their website. The three photos above of the young Blanding’s turtles are all from the release site at Shiawassee and this video is from the Detroit Zoo and it explains their “head start” program. 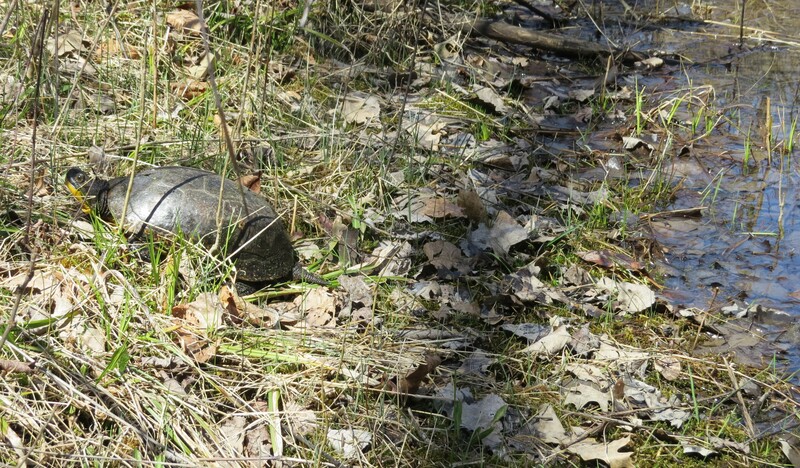 With the egg-laying season over and the heat of the summer continuing, our local Blanding’s turtles tend to stay in or immediately adjacent of their wetlands; especially those that are dominated by shrubs such as buttonbush, an aptly named shrub with ball-like blossoms that attract honey bees. Autumn brings short-lived opportunities to view Blanding’s turtle sunning, but by the time of the first frost they have burrowed down into soft muck and that’s where they remain in a hibernation like state; until early spring when the jingle of thousands of spring peepers calling from the wetlands serves as the wake-up call to the Blanding’s turtles of the wilder side of Oakland county.